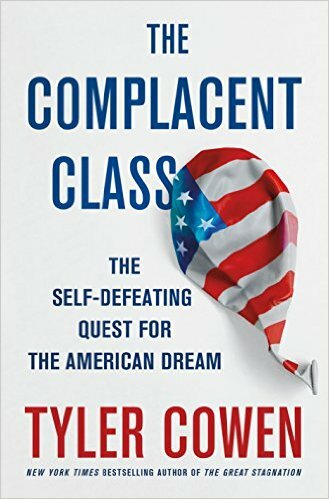 In The Complacent Class: The Self-Defeating Quest for the American Dream, Tyler Cowen extends his previous work on economic stagnation into an examination of a broader sense of stasis that has enveloped US society and culture. While events of 2016 have made the book’s anticipation of an impending and dramatic shift less prescient than may otherwise have been the case, Dalibor Rohac nonetheless welcomes the book for its important observations about the end – whether here or to come – of US domestic complacency. The Complacent Class: The Self-Defeating Quest for the American Dream. Tyler Cowen. St. Martin’s Press. 2017. Politically speaking, 2016 was dramatic – and 2017 promises to be even more so. Yet, Americans are living in a world of historically unprecedented stability and calm. Fewer people move for jobs, and those who have jobs tend to stay in them for longer. For all the talk of disruption and change, the US economy – like the economies of other advanced Western nations – has become less dynamic, with miniscule rates of productivity growth. A dominant part of federal spending is on autopilot, dictated by commitments made by earlier generations of politicians instead of being the subject of day-to-day political deliberations. Tyler Cowen has made arguments about the West’s economic stagnation before. In his latest book, The Complacent Class: The Self-Defeating Quest for the American Dream, he extends these into a much richer narrative that weaves together observations about stasis in the US economy, the impact of technology in curating our personal bubbles, broader cultural trends including developments on college campuses and the dysfunctions of US politics. Taken together, these phenomena have created a ‘zeitgeist of community-enforced social stasis’, with manifestations ranging from the NIMBY (‘Not In My Backyard’) mentality through to NIMTOO (‘Not in My Term of Office’), CAVE (‘Citizens Against Virtually Everything’) and BANANA (‘Build Absolutely Nothing Anywhere Near Anything’). Even if stasis is a correct description of the past decades of US history, the main weakness of Cowen’s book is that it reads like a description of an era that is now over. Under the new administration, drastic changes seem like the safe bet, even though their exact contours are still radically uncertain. Cowen acknowledges that complacency is not sustainable as a permanent state of affairs. Yet in today’s unsettling time, his prediction of a ‘Great Reset’ at an uncertain time in the future does not strike one as nearly as prophetic as it likely would have been had the book been published a year or two ago. That does not detract, however, from the validity – and importance – of a number of observations that Cowen makes. First, what accounts for the decline in America’s economic dynamism? One culprit is the improved ability of people to match their consumption patterns and surroundings to their preferences. Some of the consequences are perfectly benign. With Spotify and other platforms, it is easier to find and listen only to music you like. It is much simpler to find the right bargain through eBay than by visiting actual consignment stores. As a result, the consumer choices we make tend to be more satisfying and last us longer. On the flipside, because matches are better, there are fewer of them. That leads to less churn and dynamism in the economy. Moreover, better matching does not help everyone equally and leaves many Americans behind. The matches between individuals of high socioeconomic status result in stable marriages and low divorce rates. Simultaneously, marital norms among lower-educated lower earners have all but collapsed over recent decades. Matching is also at work as cities gentrify, creating more desirable surroundings for the more successful, while pricing out poorer segments of the population. The outcomes include falling social and geographic mobility and segregation by income as well as race. On the labour markets, better matching means that the highly skilled, productive and bright find it easier to interact with each other, leading to the emergence of clusters of highly successful firms in places such as the Silicon Valley. Companies typically rely on extremely stringent hiring standards, which take into account not just credentials and cognitive skills but also expected fit with the corporate culture – oftentimes proxied for by credit rating (which is apparently checked for 60 per cent of all new hires). If, for whatever reason, you are suspected of being a misfit, climbing the social and economic ladder will be extremely difficult. In a sense, Cowen argues, highly hierarchical societies such as Korea offer greater opportunities for upward mobility, since they provide a set of behavioural norms – such as deference to one’s bosses, adherence to the dress code and other corporate mores – which enable individuals to succeed, even when starting from nothing. The government is another source of stasis. Only twenty per cent of federal spending is determined by actual political deliberation, a fraction that is expected to fall to just ten per cent by 2022. The rest is dictated by existing obligations. The US Congress has also resigned itself to playing a much smaller role in making decisions about war and peace: ‘After the highly unpopular Iraq war, representatives do not want to be burdened by a ‘‘war vote’’,’ writes Cowen, ‘instead preferring plausible deniability’. While much of the reporting in recent years has focused on the gridlock and divisions within Congress and across different branches of government, the true problem is that elected US representatives simply do not care enough to reverse the status quo. Paradoxically, they are re-elected at high rates, notwithstanding the extremely low levels of trust in Congress, suggesting that large parts of the electorate, too, are content with, or at least indifferent to, more of the same. Ultimately, America’s stasis cannot last forever. At home, if the existing social order limits the prospects of large numbers of Americans, they will turn against it. Internationally, the static calm in liberal democracies increases the pay-off from predatory behaviour by actors such as Vladimir Putin or Kim Jong-un. If Crimea can be annexed without prompting a forceful response, why not try something more outlandish? With the West seeking to be only left stable and undisturbed instead of acting as the world’s policeman, the incidence of local conflicts and attempts to extort liberal democracies will only rise, thus eroding the peace and stability we have known throughout much of our lifetimes. Dalibor Rohac is a research fellow at the American Enterprise Institute. Twitter: @daliborrohac. Read more by Dalibor Rohac.